Hello again world of WordPress, I’m taking the time to write a fan admiration piece for the late, great Jaco Pastorious. While I’m primarily a rock bassist influenced by players like Steve Harris and Cliff Burton, I have nothing but respect for the players who pioneered the bass guitar into it’s own solo instrument. This is what Jaco Pastorious did with bass in the early 1970s, not just by being an amazing player who helped re-define and revive Jazz, but did so on his own terms (including his own unique sound in that he made the fretless bass guitar popular). What amazes me about some prodigious musicians like Jaco is how they they never let their fame go to their head. Jaco struggled with manic depression and bi-polar most of his life, and was killed by a club bouncer in 1987. He left behind a wonderful legacy with his music, and I hope more people who chime in elitist comments like “Jaco never needed to slap or use a five string bass” will realize Jaco was just a normal guy who eloquently played what he wanted too. Other musicians shouldn’t be criticized for their preferences on technique or style, but instead on how much they dedicate themselves to excelling with that style or technique (withholding conversations about auto-tune). While Jaco never directly influenced my playing styles (I’m a heavy metal bassist), his words about hard work ring true to me in how I should apply myself musically from now on. I had a hard time being a music major in college in that I couldn’t read music on a professional level, but if I had known that even the greats of bass got stuck on reading, and busted their asses off; it probably would have helped me get over my mental blocks with sheet music. I hope this blog has spread some awareness into the mind of bass players for all of you non-bassists out there in the world. They say bass is often felt and not heard, and I find this to be true until people are made more aware of bass through being told what to look for. 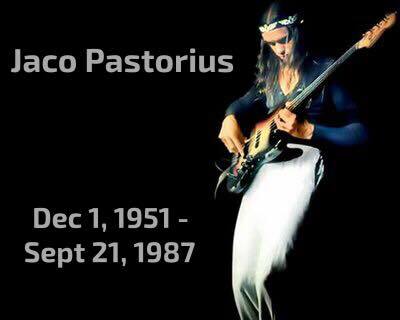 RIP Jaco Pastorious, I’m sure you’re jamming somewhere in heaven with the other greats of jazz. Hello again world of WordPress, it is I, Darth Vader. I mean, Kevin again. I just wanted to give people another life update about where I’ve been with how infrequent my posts have been. Big news, friends! My dating endeavors are done for the time being in that I’ve finally found a girlfriend. I don’t expect the relationship to be the same as my previous four year engagement, but it should be nice to start the chapter in my love life and be close to somebody once again. In other news, I’ve since moved out of my parent’s house (my childhood home), and I’m now living independently with my band’s drummer. I will be reviewing “Fear The Walking Dead” when I get a chance to catch up with the episodes now that I have a reliable internet connection where I’m living. I don’t expect everything to be sunshine and rainbows, but I will try to not mind the rainy days either as I’m happy with where I am right now. I look forward to continue writing for my WordPress and Twitter Audience for a very long time to come. Thank you all once again for checking out my blog, you’re all the reason I keep writing.